Whether you are a caregiver by relationship or hire, this group is for you! The transition into the role of Caregiver can be tricky, no matter how organized and emotionally balanced you are. The good intentions in offering to be the Primary Caregiver for a parent or spouse may lead to unexpected stress and challenges. Community members have requested that this Support Group return to Tutu’s House, so we will meet on the 1st Wednesday of each month to collaboratively educate each other about our journeys and what we have learned along the way. These conversations assist in mentally and functionally managing the responsibilities that come with caring for an adult loved one. We also welcome those of you who may be looking ahead to a possible caregiving situation. Last month I reviewed the past five years of Kupuna Transitions articles and gave some condensed thoughts about some of the topics that had come up over that span of time. There was too much content for one month’s column, so I’d like to zero in on some options for those helping an individual with cognitive challenges. When someone demonstrates signs of memory impairment, it is often family and friends who do step in and offer help. 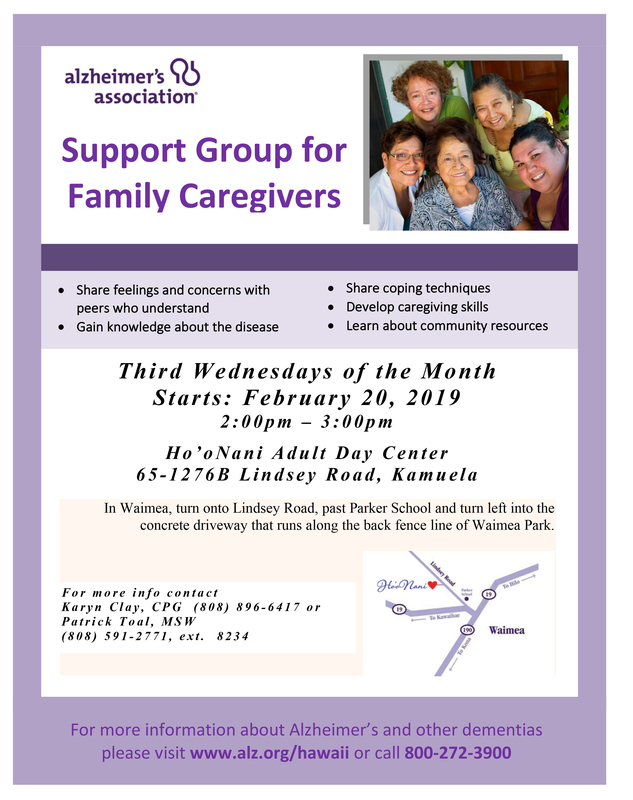 The individual’s medical professional is usually the first place they start, and I hope loved ones will continue to seek support through organizations like the Hawaii County Office of Aging and local Alzheimer’s Association expert Patrick Toal, as well. Community resources are critical, as there are choices that need to be made regarding care and living arrangements, along with legal documents that need to be put in place. Many people feel that they are smart enough to be able to tackle these things on their own, but what they may not consider is the power of experience. Therefore, educating oneself through the guidance of professionals can be a great help based on tried and true approaches. Support groups also provide camaraderie and tips to help the person who is helping others. Collaboration in family caregiving situations is also very important. Being on the same page as many different personalities come together is not simple. Finding common ground based on their love for someone needing help is essential, and supporting each other through this dynamic does improve the whole experience. Even if you don’t always agree on the best course of action, honoring each other’s ideas and gently stating your own reasons behind your choices can be a good starting point. Often there is a primary care giver who holds on to the reigns of responsibility and has a hard time utilizing the support around them. Sometimes they feel they are the only one who can do it all correctly. Learning how to let go of the idea that they are now scripting the other person’s life story will hopefully help that individual allow others to feel valuable to the situation. Being in a 24/7 dynamic with a loved one who needs our full attention and support can also shift the balance of the relationship, as there is so much to be responsible for. We often help someone based on meaningful past experiences that connect us to each other, so reflecting upon and discussing those good times will help keep the true nature of the relationship in a positive light. If they get all of the details wrong, avoid confusing them with the facts and join them in their world. They say that ignorance is bliss for a reason, so let their mind take them where it may if it feels good to them. It is also helpful to remember that the individual did not ask for this and is on a challenging journey of their own. Bad behavior in those with some type of dementia is not personal, but rather a symptom of the disease. If it feels difficult to offer kind and patient support, that is a clear sign that you are in too deep and are doing too much. Time away from the care situation can be very nourishing, and can help you return to the house with a lighter approach. I hope these words are helpful, and wish you all humor amid the chaos of care! This month marks my five-year anniversary of writing this Kupuna Transitions column. I am grateful for the opportunity every month that I get to sit down and share ideas with our Hawaii community about caring for ourselves and the older adults in our lives. Your positive response and comments in the community have encouraged me to continue to create messages that hopefully inspire and support you. I wish I could give each reader a big high five! In reviewing my contributions since March 2014, I noted a few common topics that I’d like to highlight over the next few months. Communication is the first subject that has come up many times over the past five years. The words we use, and think, can have a powerful effect on those around us. I found that many people use infantizing words around older people like cutie and sweetie. This usually comes out of care and concern, almost a nurturing instinct, yet it may feel condescending or childish to the full-fledged adult they are speaking to. A great way to utilize communication for good is the ask about the life stories of those older adults in our lives. It helps to validate the whole individual rather than the present tense problems they may be facing, and also opens the door for great advice that can be passed down to the generations following us. Communication also goes far beyond the actual words that are coming out of our mouths. Irritated tones often break down relationships, and they often come out of burn-out from being responsible for someone else’s well-being 24/7. This leads to the importance of self care in order for the care giver to find resilience amidst the challenges they may face on a daily basis. There are many tools available to assist us all in finding peace amidst the storms of life. Stepping out and silently appreciating nature is the quickest way to get a shot of perspective. There are also a variety of meditation apps that can bring peaceful sounds or guided meditations to our fingertips and help us breathe through the present moment until we find our emotional balance. Appreciating what we do have keeps our attention on growth and opportunity and helps limit the amount of time we stay in the dark cloud of misfortune. It is human nature to focus on our shortcomings over our strengths, so we need to be intentional about building ourselves and our situations up. Emphasizing on what we are good at and bringing others into the situation who excel in other areas will likely help create the best case scenario when providing care. Ultimately, the way we communicate with ourselves and others create our life experience. We make so many small choices every day that we seem to forget that we are in control of the direction of our lives. Believe in your ability to adapt and grow through these experiences and life will be a beautiful mosaic to look back upon. I personally would like to thank my husband and my father, the two most important men in my life, for supporting me the past five years. My dad sends kind words of appreciation after each article, and my husband helps me to find the exact wording that speaks to my heart when I’m too caught up in the passion to see the light. My 10-year-old daughter has also been an ongoing inspiration, as she is my sunshine, and she says that I am her sky. It doesn’t get much better than that!